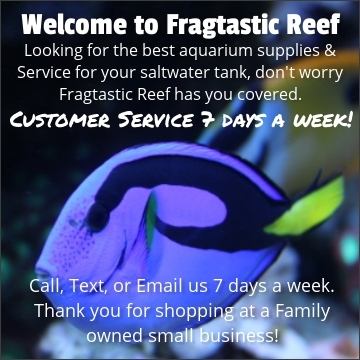 SAVE MONEY ON AQUARIUM SUPPLIES EVERY ORDER WITH A FRAGTASTIC MEMBERSHIP! Fragtastic Reef membership program is just like at a local fish store or LFS. Since we own a LFS we thought it was about time for us to do memberships and loyalty programs for our customers. You will not only get the standard reward points that everyone gets of 5%, but will get exclusive deals and up to 5% OFF on every order you place! As a member your in an elite club of people that are given rewards and special deals on select items. Members will also get exclusive discounts on products, membership only giveaways, even special large discounts on select items throughout the year. Rewards and any discounts are on order totals not including shipping. Discounts can't be applied to Ecotech or AI, which is restricted by the manufacture. Please see our Membership page or Contact Us for any questions. NO COUPON CODES NEEDED WITH A MEMBERSHIP - YOU ALWAYS SAVE MONEY! Fragtastic Experience - See Gold or Lifetime Gold Memberships for details. Lifetime Membership - Pay only one time - FOREVER! Be sure to create an account on our website BEFORE placing your order for the Membership. This will allow us to change your account to "membership status" so you can start getting rewards. We can't change already existing orders in the system, so you will wanna order your Membership first, then contact us so we can change your account to what Membership you purchased. Rewards for memberships will be given on EVERY order after the membership purchase, so if your going to order a large purchase make sure to get your membership first! Ever done a group buy somewhere else? A Membership is the same exact thing as doing a group buy at another place, but better because you can decide when to use it and not wait for others. A Membership is an exclusive group of individuals, just like a group buy program. Only difference with a Membership is you get to place your order anytime you want, plus the additional benefits and prizes we have throughout the year! Only members can see the specials and receive the deals, just like a group buy participant. So why do a Membership over a Group Buy? Well there is a lot of reasons of course, but the biggest reason is because there is no organizing needed, no waiting, and its always here for you! Discounts are not valid on MRP (minimum retail price) products such as Ecotech Marine and AI. MAP (Minimum Advertised Pricing) products are eligible based on Manufacture restrictions. Rewards and other discounts can also be limited based on manufacture restrictions.